Will you be traveling sometimes soon to your much-deserved and needed holiday? Weekend getaways & 10 day holidays can’t go wrong when you are well equipped for them. If this time you want to look fabulous and beautiful when tanning in the sun, or even when getting off your flight, this article will help you achieve that! Here, we will list you the top 7 makeup items that should always be with you. Your skin will love you if you take good care of it. Women of all ages should have some collagen-based products since these can help with the tiredness (that you may expect after traveling for so long), as well as with the glow level of your skin. A rich serum or your daily moisturizer will make such a huge improvement for your skin’s texture. Your pores won’t get clogged, and your foundation will stick so much better on cleansed skin. A) Why would you want to waste your time applying several coats and layers of something so heavy? B) During the holidays, you should let your skin breathe as much as possible and you should let it rest. If you want to feel good after traveling for 5-6 hours just have a good and lightweight BB cream, and some concealer. Don’t pack translucent powders, bronzers, or blushes since these can take away too much of your ‘getting ready’ time. Besides your BB cream and the concealer, you can also bring some liquid highlighter, these are great at giving you a rested and youthful look. Setting sprays became a huge hit in the last couple of years, while ten years ago no one was really into them. Nowadays a setting spray is a great choice if you want to give yourself long-lasting and sealed makeup. This spray contains a fine mist which is quite hydrating and you will only need 3 pumps of the bottle to enjoy your makeup for hours! You can also use this spray to restore back moisture whenever your skin starts feeling dry. Setting sprays can leave you with satin and radiant finish (which is great if your skin is dry), or you can have a mattifying finish (which is great if your skin is quite oily). Applying eyeshadows as well as false lashes can be so annoying and time-consuming when you are trying to enjoy your beauty sleep and your vacation. Also, if you are someone who likes to travel light, then there is no reason for you to bring your mascaras, glue-on lashes, lash tweezers, glue, or even eyeliner! Instead, how about you do lash extensions? These are a semi-permanent solution which can last for 3 weeks. Lash extensions are done at a salon by a certified esthetician and are applied one by one on top of your natural lashes. They are heat-proof, waterproof, and smudge-proof, meaning that you can enjoy your swimming and tanning carefree! The best part is that they can look really natural, or however you want them to look-all based on your preference. Lipsticks are a must wherever you go and no matter the current weather season. Some women prefer liquid lipsticks, while others turn to mattes and satins. However, in this case, the best choice would be a lip balm, tinted lipstick, or even a lip gloss. Anything else might be too drying and uncomfortable for several hours, and don’t forget that your lips demand moisture. You can restore it by applying your lip balm every 3 hours and then on top apply your favorite creamy lipstick. Eyebrows can be such a hassle to do when you are on vacation. Every woman should, at least, pluck them before she arrives at her favorite spot. This will save you so much time and you will be a bit reckless once you get to your destination. Also, only bring a tinted brow gel with you since it can make such a difference for your natural brows. It is consistent out of tiny little fibers which will give you a noticeable fill, as well as a good hold throughout the day. Women who have naturally bushy brows won’t even need this as their go-to product. Also, if you’ve did microblading you will be set for the entire period as well. Last, but not least, don’t forget a good face mask. These can be a life-changing tool if your skin dries out on the road, or even if you experience a slight sunburn. You can simply apply it on top of your skin and enjoy for 15 minutes each night. A sheet mask will restore moisture & hydration and will calm down your skin. Also, you will get rid of any puffiness or redness around your eyes in less than 15 minutes! Make sure that your mask suits your skin type, and also make sure it has some aloe vera in it. This is great since it gives moisture and boosts your collagen production. Top 10 Tips for Applying Makeup to Acne prone Skin! If we lived in an ideal world, we´d all have flawless skin. However, we live in a world where not all of us are blessed with good genes. Therefore, many of us have to deal with the outbreak of acne, making it extremely difficult to apply makeup. Fortunately, you need not worry as we have listed 10 tips for applying makeup to acne prone skin. For more tips, visit Make Me Up Mandy. If you find that your skin is flaky because of the over application of acne cream, you can use scotch tape to remedy the situation. All that’s required of you to do is to pat your skin with it. It is not necessary for you to use heavy makeup to cover your acne scars. In fact, the over application of makeup only sheds light on the acne. Therefore, you should instead use sheer foundation to put the spotlight on the rest of your acne-free skin. Concealers should be used to cover up acne. When you apply foundation on the blemishes, you must do so with care; avoid dabbing more than necessary. Sometimes, discoloration may still occur despite the use of concealers and sheer foundation. During those times, you can use a color corrector to ensure that the makeup blends in. It is also advisable for you to add brightness to your complexion towards the end of your makeup routine. This will help bring glow to your skin which can otherwise be dull because of the use of primer, color correctors, blush etc. You shouldn’t use cream foundations on your acne prone skin when applying makeup. It might be tempting to go all out with the concealers and foundation to hide the scars, but it will not enhance your appearance. In fact, it will make you stand out for all the wrong reasons. We can do without unwanted attention. Here´s another important tip for you! You should ensure that your eyes are soft and nice when applying makeup to your acne prone skin. Therefore, you should avoid using dark mascara at all costs. It is important for you to moisturize your face properly before you begin your makeup routine. Failure to do so often leads to chalky and rough looking skin, which, in turn, only brings more attention to your scars. You must, at all costs, remove your makeup before you go to sleep. If you fail to do so, your skin will not breathe properly and the pores will clog up. And, the clogging of the pores could lead to the growth of more acne. This tip is really a no-brainer. It is imperative for you to wash your hands before you begin your makeup routine. We wouldn’t want any bacteria, oil, and dirt on your face now, would we? 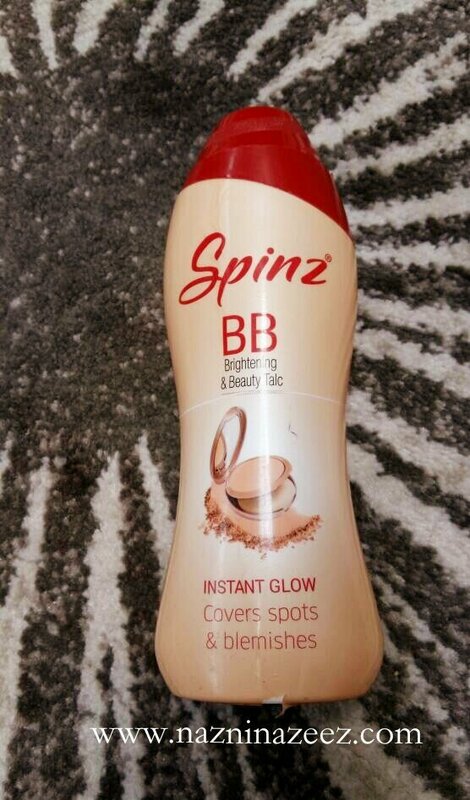 Review : Spinz BB Talc! All of you are familiar with BB creams. They are everywhere. However, recently, I saw a different variation of the BB concept – a BB talcum powder!. BB here, stands for ‘Brightening & Beauty’. It’s by the brand Spinz. This powder gives an instant glow to the skin. As it says on the tin, it does cover spots and blemishes, to an extend. It’s perfect to get rid of that undesirable oiliness that forms on the face, on a hot, humid day. The powder is very similar to powder foundation, but has an orangeish color and is very fine in texture. I found this in Lulu Mall, Edappalli, Kerala. It’s hard to find it anywhere else. I definitely recommend it. Spinz has different types of powder talcs, that are easily available everywhere. However, this one is found only in Lulu, as far as I know. Price : Rs 75 (Approx AED 4.25) for a 100 gms pack. Review : SKIN79 Wonder Fix Brush Eyeliner! It’s brush is super pointy yet soft and flexible enough to create a modulable thickness while getting in the inner corner of the eye really well. The color that I got is #2 Brown. It looks great against my black pupils. The liner reminds me of a marker. The color payoff is good and it can be build up to be darker. Also, when shaken, something moves back and forth, inside and reminds me much of how a white ink pen works. This liner definitely is a fool proof way to achieve THE most perfect winged eyeliner look.. I bought this from Glambox Middle East’s online e-shop. I would have linked you the Buy link however unfortunately their e-shop has closed since Oct ’16. I purchased this in Sep.
Price : AED 65 (Approx $17.79) for 0.5gms. If you are looking for a drugstore dupe for this, definitely try out Physicians Formula’s Eye Definer Felt Tip Eye Marker which I’ve reviewed here. It’s price is $7.25 (Approx AED 26.63) & is 0.8 gms. Guest post : Bridal Beauty Trends 2016! My name is Miranda, and I am a professional hairstylist based in New York. I have been in the fashion industry for the past 10 years and have been graced to work with the some of the top ranking professionals in the field. For the latest information on hair styling trends 2016, tips and more, check out my Hair straightener reviews. The wedding day is the most cherished occasion of any girl’s life as she desires to look her exceptional best on her big day to get incredible accolades and lifelong memories. In this article, we’ll look at the latest bridal beauty trends for all those beauties who are going to get their wedding bells rung soon. These bridal beauty trends are highly innovative yet trendy as they serve to create a magnificent look for your D-day. A bride needs to choose the best wedding gown, makeup and hair accessories to achieve perfect glow that draws all eyes on her. However, an even greater need is about having clear skin that is ready to show the enigmatic diva in you to make the event memorable. One of the most prominent trends of the year 2016 for the brides is to opt for a natural look that is accompanied with minimal makeup like a light colored foundation along with a glow on the cheeks complimented with a natural shade of lipstick. To achieve this look, one needs skin that is well moisturized and has the slightest foundation to cover up any spot or blemish in a single stroke. Moreover, the application of a natural color blush would enhance the glow to the skin with a light shaded lipstick. This light makeup work will ensure that you look simply beautiful. Another latest bridal makeup trend is the use of a highlighter stick that helps to get the glowing and not the undesired shiny look. It is intended to provide the dewy look that provides the amazing glow and shimmer to make your face naturally brightens up to enhance your looks. It is required to be applied to the apple of the cheeks, under the eyebrow and the inner corner of the eyes to provide the stunning looks that make you look mesmerizing, so get ready to try this look with remarkable perfection. Yes, you can increase your charm and classic look with the use of a lip gloss on your wedding day to get the desired look, but it should be applied carefully to avoid the messy look. All you need to do is to use a lip balm on your lips and choose a light colored lipstick of your choice and add a subtle layer of lip gloss to make you look perfectly flawless. Make sure that you don’t spoil your looks with the incorrect application of a lip-gloss as even the slightest faulty application can ruin your look. Another latest trend of the bridal makeup for 2016 is the use of a pink lipstick accompanied with the use of winged eyeliner along with the added charm of rosy cheeks to create the magnificent look that is certainly going to make you look classy. The brown makeup for eyes is a real winner when it comes to the idea of getting the perfect natural look. In fact, you can use the Mac brown eyeshadow that should be enhanced with the use of brown eyeliner and no need to use mascara to get the classy look for your D-day. Moreover, you can use a light colored foundation and natural lipstick to get your preferred look with ease and perfection. On a whole, check out these simple tips to make your wedding day the most memorable one by picking the nice gown and perfect accessories accompanied with a natural makeup tone that would make you look like a real diva. So, stay happy and stay stylish with the right makeup! Note: I am not compensated in any way for the publication of this post. Bourjois wishes you a beautiful Mother’s Day! Point Of Sale :Wojooh, www.wojooh.com, Lifestyle, MAX and Boots.